As impressive as these Meatball Eggrolls with Sundried Tomato Tapenade may look, they’re one of the easier recipes you can cook for Game Day Snacks. Make the meatball filling the day before you wrap and pan fry the eggrolls and just pick up some tomato tapenade at the store. 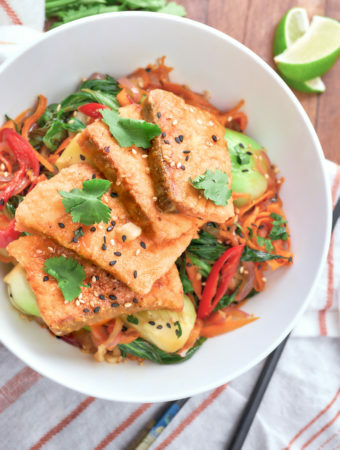 This recipe is part of a 17 part seasonal series called Eat Up! 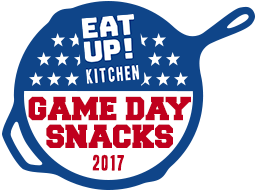 Kitchen – 2017 Game Day Snacks. Stay tuned for a new Game Day Snack each week! For my second week of Eat Up! Kitchen Game Day Snacks, I was inspired by the delicious and easy to eat finger food – cheesesteak eggrolls. Instead of cheesesteak though, why not fill our egg rolls with meatballs?! It’s actually way easier and more forgiving than cooking the cheesesteak filling. For the meatball filling, I cooked equal parts lean ground beef and ground pork with some salt, pepper, red pepper flakes, parsley, and Worcestershire sauce – for added meatballiness. Let the filling get to room temp or refrigerate it over night. Then mix in two parts (by volume) freshly grated mozzarella cheese to three parts meat filling in a bowl. Make some one inch round meatballs and place them on your eggroll wrapper. Press them down a bit to form them in to more of a sausage shape then do your eggrollin’. You could prep to this stage the night before then set them in the refrigerator until the pregame show starts. To fry these up just add an inch of vegetable or canola oil to a deep pan or pot and fry for 2 minutes per side until they get gorgeous looking. Ideally you want to serve these hot from the stovetop so your fans get that ooey gooey mozzy cheesiness. Sundried tomato tapenade is not a difficult thing to make but I happened to come across some in a jar for five bucks. I’m quite pleased with my purchase. If you can find Meditalia brand, I’d go with that. 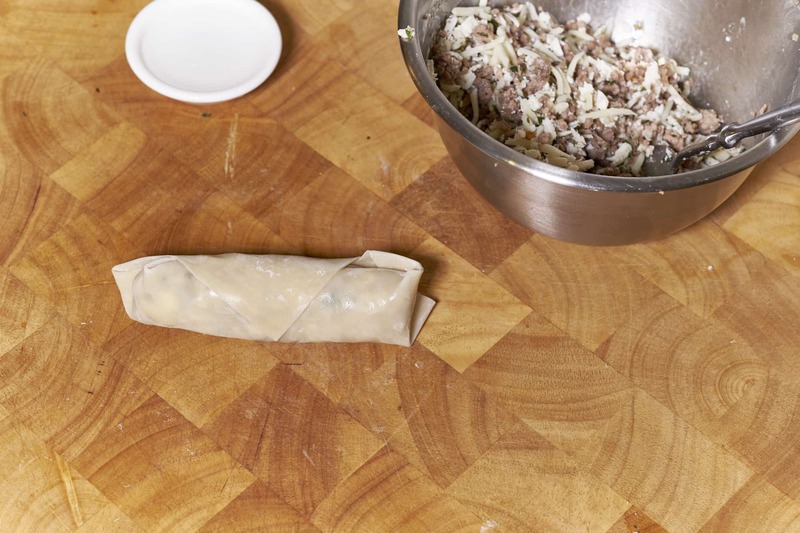 Make some one inch round meatballs and place them on your eggroll wrapper. Press them down a bit to form them in to more of a sausage shape. Bring the bottom corner up and over the filling, bring the left and right sides in and roll over. Add a bit of water on the top corner to complete the roll. 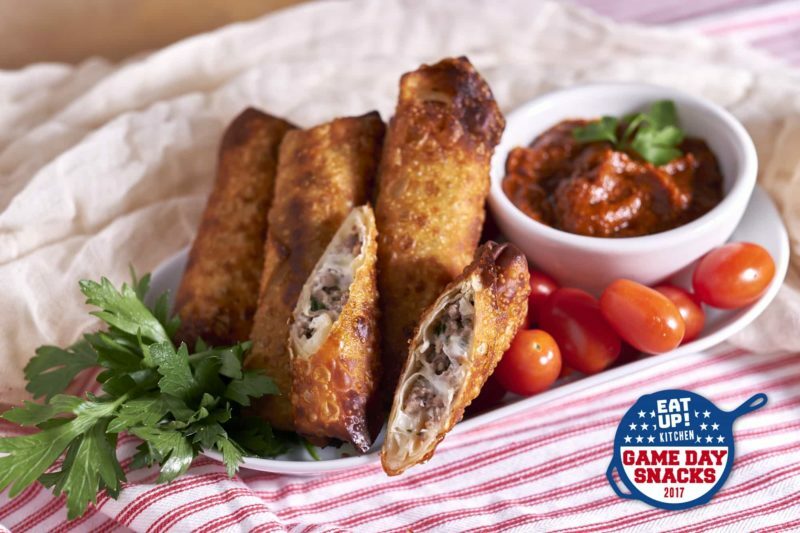 As impressive as these Meatball Eggrolls with Sundried Tomato Tapenade may look, they're one of the easier recipes you can cook for Game Day Snacks. 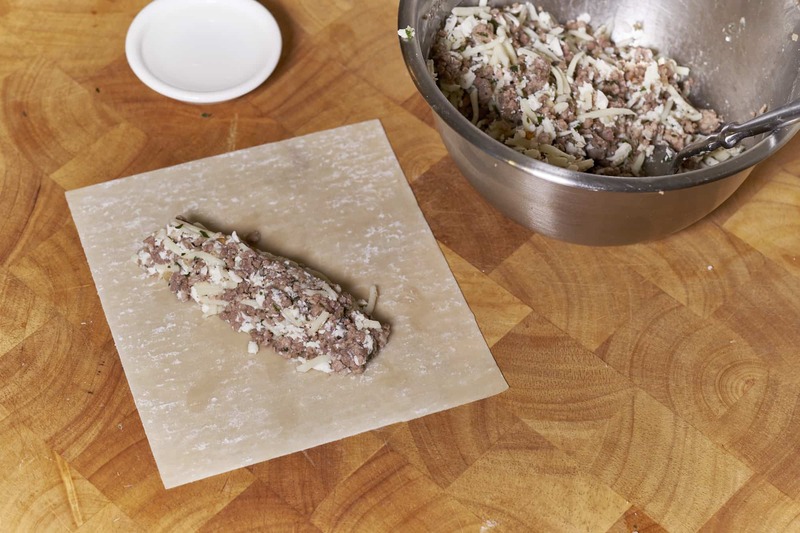 Make the meatball filling the day before you wrap and pan fry the eggrolls and just pick up some tomato tapenade at the store. 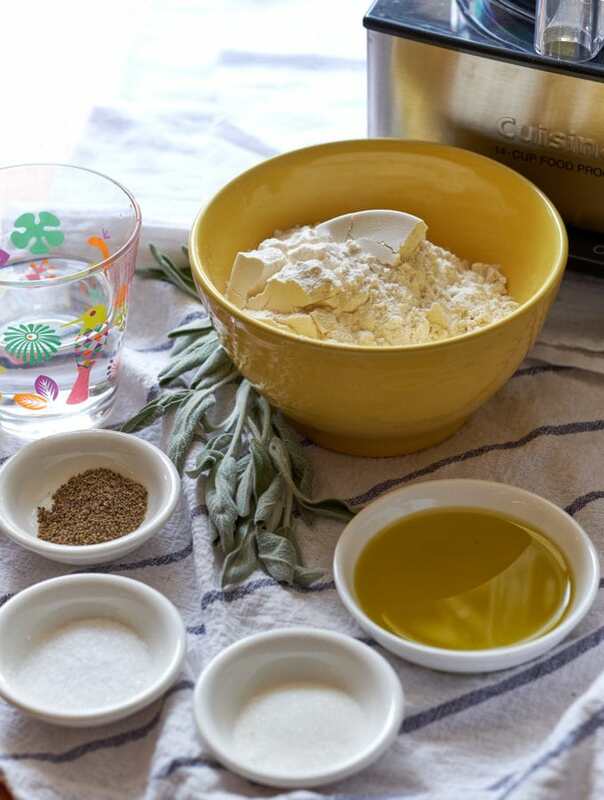 Add a tablespoon of olive oil to large pan over medium high heat. Cook the onions with the salt, pepper, pepper flakes, and oregano until they're translucent. Stir fry the beef and pork with the onions for a few minutes then add the worchestershire sauce and the parsley. Continue stirring the mixture to prevent the meat from clumping. Taste and adjust for seasoning. Eggroll filling is done when meat is cooked through. 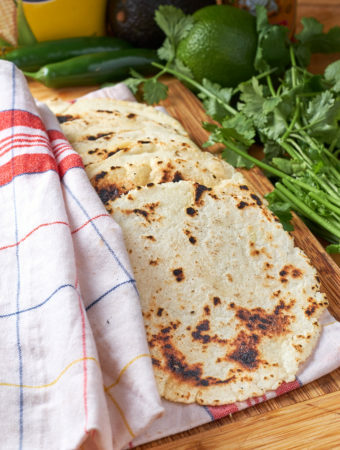 Set aside to cool to room temp or refrigerate overnight. 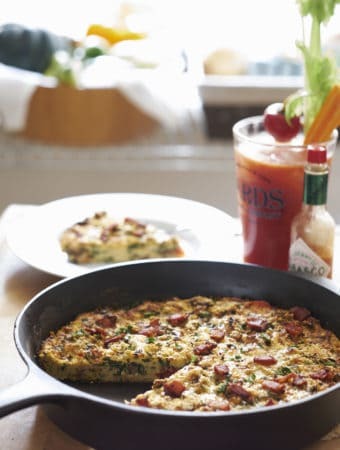 Once the meat mixture has cooled, incorporate the mozzarella cheese. Add any left over parsley if you have some. Place the eggroll wrapper in front of you so the corners are at north / south. Add a bit of water to the top corner. 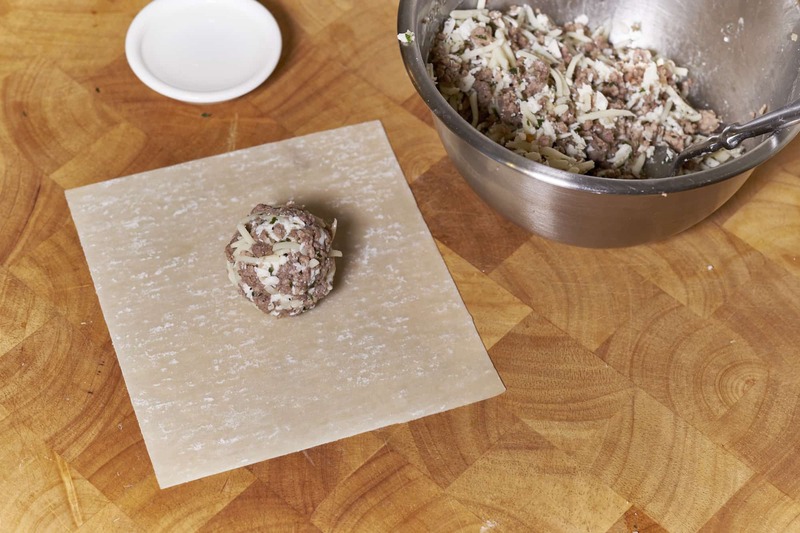 Make one inch round meatballs and place them on the wrapper. Press down and form in to an elongated sausage shape. Tightly bring the bottom corner of the wrapper up and over the filling. 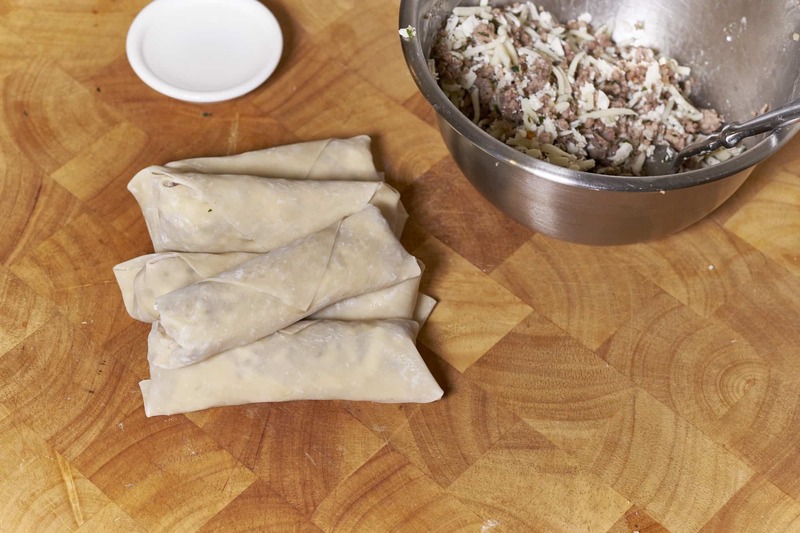 Bring the left and right sides in then continue rolling the eggroll up so it seals itself on the top corner. Add an inch of vegetable oil to a deep pot or pan and heat over a medium flame. Without crowding the pan, fry eggrolls for 1-2 minutes per side until golden brown. Set aside on paper towels to drain. Serve hot with sundried tomato tapenade for dipping. If your not serving right way, you can leave them in a warm oven loosely tented with foil.